It can be challenging to perfect your fundraising strategy in order to accelerate your work. As a past marketing and business development focused entrepreneur I’ve been exposed to the fundraising environment outside of the life science and healthcare industry. It may be counter-intuitive, but fundraising processes (as well as constructing partnerships) are similar across different industries except for their smaller nuances. Scientist-entrepreneurs and fundraising CEOs need to know that a clear value proposition made up of your tagline, executive summary and more will be the differentiating factor in progressing your discussions with investors past the initial conversation. The ones who can share their value proposition with the most clarity, are the ones investors will move forward with for fundraising opportunities. Here are some fundamentals everyone needs to know. Entrepreneurs know it takes a lot of hard work, dedication, and funds to make a company successful. If you’re new to the fundraising sphere within the life science and healthcare industry, you may be unsure what to prioritize and where to start. Life Science Nation (LSN) is a company focused on providing resources and conferences focused on initiating new opportunities for strategic partnerships and fundraising activities. LSN makes it as straightforward and simple as possible so you can maximize your success. That means having a solid understanding of the fundraising process and knowing what steps to take in order to execute a deal or partnership. At the foundation, it’s imperative to understand your own branding and communicate it clearly to your constituents. If you don’t understand your product, services, and goals, they won’t either. This includes clearly defining your addressable market and growth potential to global investors and strategic partners. Otherwise, it will be an upward battle to convince them to support you as a partner or financially. If you then consider that it takes 6-18 months to fundraise (always longer than hoped or expected), clarity for your mission becomes crucial to speeding up the fundraising or partnership process. LSN wants companies to be ready for the initial conversations so they can get to the next phase sooner. The next conversations are where you work through the deals and partnerships, and not stumbling over the value proposition for too long. Know your product set, it’s development stage, and how it fits into investors mandates and requirements. Make sure you have these to share verbally as well as through marketing materials: an executive summary, pitch deck, etc. Now that you’ve defined your company, goals, and growth potential, it’s time to create a target list of investors or strategic partners. This can be a daunting task and normally starts by networking with current, established relationships. This is a great starting point to expand your network, and will usually provide hot leads for best matches. LSN expands upon this by opening up companies and investors to their network of constituents. It is a real advantage, where other industries have to rely solely on their personal connections. If you can match you and your company with the right fit people for you, then it’s a lot easier to start having those initial conversations that lead up to deals and strategic partnerships. Since this is a challenge, LSN chose to specialize and develop its company to connect products, services, and capital to support individual efforts to target an investor audience and network with potential matches. LSN created a two-sided platform: ‘For Company’ side and a ‘For Investors’ side. It’s intuitive search functions make it easy to use for sourcing information for deals and partnerships. At its core, it saves potential strategic partners, investors, and fundraising CEOs time on research, so they can instead focus on the important tasks of engaging in conversations that match their interests–filling the pipeline for new opportunities which in turn accelerate businesses, technology, and deals. 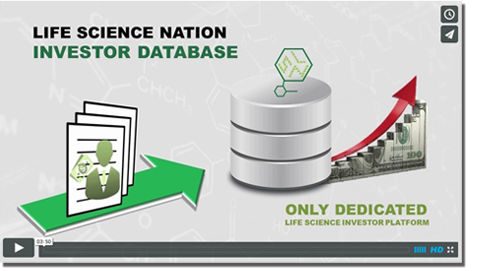 The LSN Company Platform (for investors and strategic partners) is the premier life science company database, covering over 50,000 companies from around the world, with a particular focus on the earliest stage companies who have been missed by traditional data providers. The LSN Investor Platform (for companies) includes present and future-looking investor data collected and curated by LSN’s Investor Research team through ongoing dialogue with LSN’s 5,000 life science investors from around the world. The team updates the database to only include active investors who are currently allocating funds to projects and companies that fit their mandate requirements. Includes investors from 10 categories: Angels, Corporate Venture Capital, Endowments/Foundations, Family Offices, Government Organizations, Hedge Funds, Institutional Alternative Investor, Large Pharma/Biotech, PE, and Venture Captial. Portal with filters to identify potential leads for you: location, investor types, product sets, investment interest section, phases, etc. Ask LSN for a demo to learn more. After completing your target list, you’ll realize warm introductions mean a lot in propelling the conversations forward, past the initial talks. That’s why Life Science Nation created the Redefining Early Stage Investments (RESI) conference. LSN knew entrepreneurs and fundraising CEO’s needed a central location with access to potential global investors and strategic partners. With limited time and much to do as a startup, they need tools and resources to work efficiently. While networking is crucial to any company’s success in sourcing new opportunities, RESI is the best within the life science industry in providing such a venue. The Redefining Early Stage Investments (RESI) Conference is an ongoing conference series that provides an international venue for early-stage life science companies to connect with global investors and strategic partners for new opportunities, all in one place. This includes interests across Biotech, Medtech, Diagnostics and Digital Health in order to create new relationships in these areas as well as the potential to secure funding. RESI is unique and the leading conference in partnerships due to its global network presence, unmatched by other conferences in the healthcare industry. It provides constituents with the best venue for partnering and networking. To learn more and attend upcoming events, please visit the site. Now that you’ve learned the fundamentals for your fundraising strategies and partnership opportunities, you can start defining your value proposition, creating a target audience, and network with the right people. Our corporate structure is made up of a few different business models with the same mission to accelerate therapeutics, biotech, medtech, diagnostics, and digital health within the healthcare industry. LSN started out developing a database of investors because the company felt there was not enough accessibility for investors to discover scientists-entrepreneurs and fundraising CEOs within the life sciences. Further down the line, LSN created a conference series to further accelerate and support initial conversations between these groups so progress could be made in leaps and bounds. As we continue to develop in our current political environment, it has become more important than ever to continue supporting and facilitating advances in healthcare.